The Linksys Wireless-AC Access Points have the capability to support multiple SSIDs to be broadcasted in the network. This can be configured through the Wireless Scheduler feature where you can create rules for these SSIDs to be operational on specific time intervals. With this, you can automate the enabling and disabling for SSIDs based on its profile definition. This article will guide you on how to configure the Scheduler feature on your Linksys Wireless-AC Access Point. QUICK TIP: The Wireless Scheduler supports up to 16 profiles and each profile can include four (4) time rules. This article will guide you on how to configure the Scheduler feature of your Linksys Wireless-AC Access Point. 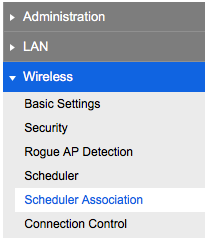 Under the Configuration tab, click Wireless > Scheduler. Tick the Enable box for Wireless Scheduler. NOTE: If this feature is disabled, even if some SSIDs are associated with the profiles, they will be always active. System time is outdated – Scheduler is inactive because system time is outdated. Administrative Mode is disabled – Scheduler is disabled by administrator. Active – Scheduler is active. Inactive – Feature is currently disabled. Enter the name in the New Profile Name field then click Add. Once added, select your Profile Name from the drop-down list to configure. 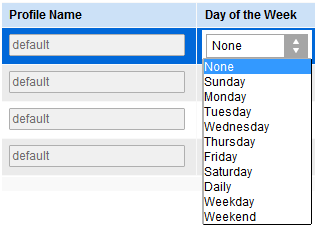 Select the desired day from the Day of the Week drop-down list. From the Day of the Week menu, select the recurring schedule for the rule. You can configure the rule to occur daily, on weekdays, on weekends or any single day of the week. NOTE: The option None means this time rule is disabled. Choose or set the Start Time and End Time. Start Time – The time when the SSID is operationally enabled. The time is in HH:MM 24-hour format. The range is <00-23>:<00-59>. The default is 00:00. End Time – The time when the SSID is operationally disabled. The time is in HH:MM 24-hour format. The range is <00-23>:<00-59>. The default is 00:00. The created profile should now be associated with the SSIDs. Under the Configuration tab, click Scheduler Association. Select the desired radio from the Wireless Radio drop-down list. Radio 1 is for 2.4 GHz, and Radio 2 is for 5 GHz. Choose a profile to associate to an SSID. Select the created profile you want to associate to the SSID. NOTE: If the profile associated with the SSID is deleted, then the association will be removed. The option None means no scheduler profile is associated. The Interface Status column displays the status of the Scheduler Association. A Disabled status represents no profile associated to the SSID None an Enabled status represents a profile is associated to the SSID. The Scheduler only works when the SSID is enabled.